If checking GAI for fertiliser application, don't forget to check for crop lodging risk. The CAT can be used at crop growth stage 12-31 to assess crop nitrogen content. The CAT can be used at crop growth stage 30-31 to assess crop lodging risk. Take a digital photograph of the crop which is representative of the field and save this to your PC. Browse and submit the photograph using the upload facility below, being sure to choose type of calculation required; assessment of 'Nitrogen Content' (from CAT) or 'Lodging Risk'. Note: To gain the most accurate results from the tool, digital photographs should be taken directly above the crop. The area of crop photographed is not critical and a 1m x 1m is perfectly adequate. It is advisable to avoid taking photographs on sunny days as this may cause shadows. Note: An image taken using a camera phone is perfectly adequate. Taking at least 3 photographs per field and averaging the CAT is also advised to get the most accurate CAT reading. The CAT will show 2 images; your original photograph and a processed black and green image to check that the tool is correctly identifying the green crop. If the tool is not correctly identifying the green crop then it is recommended that another photo is taken a few days later in different light conditions. Calculated crop N content in kg/ha. Calculated shoots/m2 (winter wheat only). The lodging risk of your crop in terms of variety Lodging Resistance Score (rating of 1-9 where 1 is high lodging risk). A BASF PGR programme tailored to that field risk at the time of taking the photograph. Disclaimer: Information coming from the use of the Canopy Assessment Tool (CAT) is to be used entirely at the user's risk and the BASF Group or ADAS Group gives no warranty in relation to the accuracy or completeness of any of the information contained. The BASF Group or ADAS Group shall have no liability to the user as a result of the possession or use of the information. 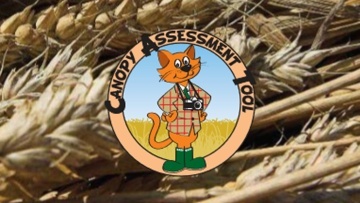 To learn more about the Canopy Assessment Tool, a pocket guide is available to download.